Zulu Sofola is one of Nigeria's foremost playwrights, the best if you ask me. Yes, better than Wole Soyinka :) I have seen a couple of them, and wish I had the opportunity to see this one too. 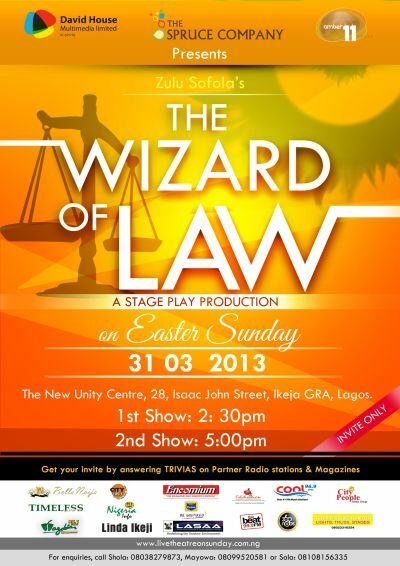 Zulu Sofola's The Wizard Of Law is being presented free on Easter Sunday at The New Unity Centre, 28 Isaac John GRA 4:30pm and 6pm. Sorry it is coming late, I just got the notice. Though free, you need to book your tickets before the show. Find them at ariyaticketsonline.com or naijaticket.com or SMS 08039754365. The Wizard of Law deals with an old lawyer, Ramoni, who has met with reversed finances and who tries at a festive period to impress his wife by purchasing expensive lace material on credit at a time when he is penniless. The cloth-seller, Rafiu, takes advantage of this opportunity to inflate the prices of cloth in order to make a heavy gain. Ramoni, not having the money with which to pay, gets more and more into trouble. He desperately looks for a court case through which he would get the needed money.